Advantages: Informative reviews, excellent cross section of material, knowledgeable contributors. The March/April edition of Windsock has hit the selves, this being the second of six issues for the year. Eagle-eyed reader would have noticed a change in the title, with the publication now reading Windsock Worldwide as opposed to International. This hasn’t altered the contents and readers will find the regular columns all present and accounted for. 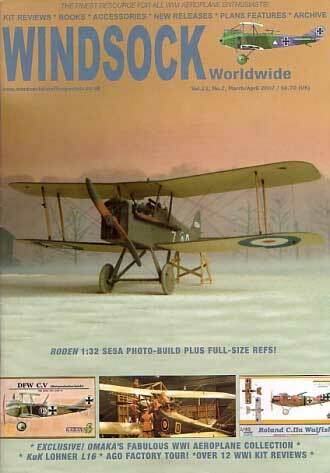 As befits the release of a new 1/32 scale subject, Roden’s SE5a takes centre stage in this latest edition. The editor himself builds this kit and describes the processes he took to achieve the result seen on the cover. Complimenting the article are some 1/12 scale detail drawings and a couple of lovely colour profiles from Ronny Bar. George Haddow continues his guide to WWI Austro-Hungarian naval aircraft with the Lohner Type M being the 7th instalment in the series. The subject of this piece of writing is L16, a flying boat that Gottfried Frieherr von Banfield scored at least six victories in! Apart from the photographs, a set of 1/72 scale drawings showcase this aircraft with some excellent artwork from Bob Pearson showing L16 in both its guises. Also featured is an interesting collection of photographs depicting the inside of the Ago factory. This rare tour comes courtesy of photographs from Colin Owers with the esteemed Harry Woodman contributing the text. Another tidbit is the colour pictures of the only surviving Nieuport 23. C.1. This aircraft has recently undergone a full restoration and more images are to follow in the future. This selection will please all those with a flair for cockpit detailing! The usual compliment of book and kit reviews makes their appearance as well as all the latest industry news. Although there are only 32 pages in this publication, a lot of information is contained within its A4 sized pages. The series is devoted to WWI aircraft enthusiasts and in particular… the modeller. All aspects are covered in this title and if you have liking for these pioneering machines, then this is the magazine for you.